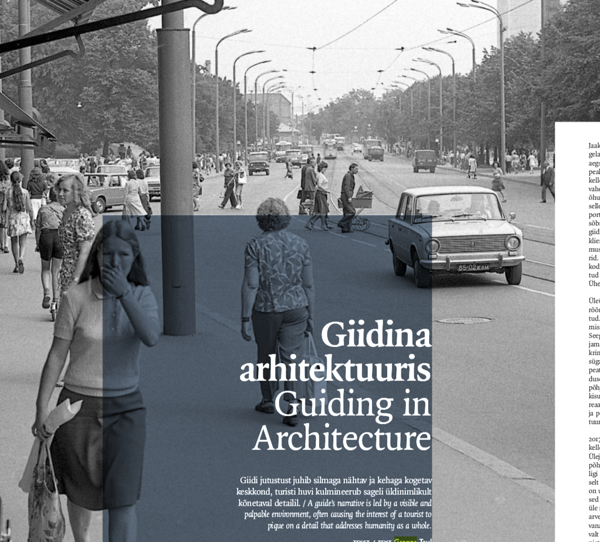 Translation of an Estonian text about tour guiding in Tallinn for the architectural quarterly Maja 2/2019. A guide’s narrative is led by a visible and palpable environment, often causing the interest of a tourist to piqued on a detail that addresses humanity as a whole. In “Mr Dikshit”, a short story by Jaak Jõerüüt, the first person narrator is guiding a mysterious Hindu visitor through stagnation era Tallinn. The tourist is quiet, yet occasionally enthused by seemingly irrelevant things, discomfiting the guide who now feels unable to mediate his culture to an audience. Working as a guide in Tallinn, I have repeatedly experienced the atmosphere of this short story, all the while trying to reformulate its beginning and end. In a sense, the author is portraying the ideal tourist in his text – an amicable, intelligent and curious individual every guide is hoping to meet when going to work. On the other hand, I would not like to over-mythologise this type of client as, in my experience, most visitors are wonderful people to talk to. This is quite natural since tourists exit their domestic comfort zone voluntarily, being open to new acquaintances and different surroundings. In other words, we are not quite ourselves when travelling. Altogether, the imperative of positivity is written into tourism as an entertainment business mediating joy. For instance, a guide’s ethics advises one to omit topics that could trigger negative reactions. To an extent, guides must therefore embellish life and hide social problem areas such as poverty or discrimination. A guide should not delve deeper into subject matter more than what the eye can see (and the eye tends to rest on beauty). On the other hand, the foundation for good guide work is trust between the speaker and the listener. Based on my experience, tourists can be spot on when identifying the moment when the tale becomes too sweet. The purpose of the guide is to find balance between sweet talk and reality, times past and present, geography and nation, culture and politics, and in the broadest sense, the visible (the architecture) and the invisible (the tales). Over six million people visited Estonia in 2017, nearly half of whom stayed at tourist accommodation establishments. The rest were day visitors – the majority from Finland, but also close to half a million cruise tourists who spent approximately eight hours in Tallinn and North Estonia. Tourism makes up about seven percent of Estonia’s GDP, with additional contributions to export earnings by foreigners. These are important numbers the entire state is invested in raising, but how often do we consider the darker side of (mass) tourism? The Old Town, chock-full of people, makes both locals as well as tourists feel uncomfortable. Visitors, who acknowledge their inherent part in the situation, often ask me what the best time to visit Estonia outside of high season would be. I usually say right now is the best time and regarding the over-crowded Old Town, that it might very well be this emotion that is most akin to an “authentic” spatial experience in medieval Reval. After all, this was one of the region’s most significant ports with thousands of traders from all over the Old World filling its streets. This is the way it should be. However, current residents of Tallinn, just like their peers from Gdańsk, Helsinki, Stockholm and Copenhagen, must admit that most tourists cruising the Baltic Sea are here to enjoy the benefits of visa-free entrance to St. Petersburg where they usually spend two or three days. Another accountable factor in the formation of a tourist’s experience when visiting the countries surrounding the Baltic Sea is enjoying the party atmosphere on the cruise ship itself. In both the Baltic and the Mediterranean, as well as the Caribbean Sea, there are plenty of vacationers who do not leave the ship throughout the cruise. Unplugging on a pleasure boat is their recreation of choice and this is completely acceptable. In recent years, a growing number of tourists from Asia have chosen Estonia as their travel destination. I often inquire from the travel courier to tourists from Beijing, Hong Kong, Singapore, Taipei and Bangkok, what their favourite destination is (they work all across the world). Many have responded that they prefer the Scandinavian and Baltic States because they feel safest here and do not have to worry about the well-being of their clients all the time. I regard this as great acknowledgment which we might not even be aware of ourselves. At the same time, I have heard that some local travel agencies select their destinations according to availability of high-quality and logistically no-nonsense East-Asian cuisine. Allegedly, Tallinn does not make the cut in this regard which is why some groups do not stay here (for long). Speaking of merchandise offered in Tallinn, I am reminded of a tour where the only client was a jet-setter from Latin America. We went from shop to shop where the individual would buy Matryoshka dolls and amber. On our coffee break, I dared to imply that these were indeed not local goods... The man decidedly cut me short and said that he understood it very well, but that he preferred leaving his money here instead of taking it to ’Russian mobsters’. No doubt, he had every right to do so, although I am not convinced by the clarity of the local amber business, either. Although I was still trying to actively guide tourists toward local souvenirs a few years ago, it now seems to me that it might not be such a bad idea to expand the borders of our “own” culture. This may lie beyond the state line and present not only our national/folk culture but the entire region’s. That is what the Hanseatic League stood for – introducing, showcasing and marketing the traditions of the various shores of the Baltic Sea. The latter was a remark with a political undertone. Ever since Trump and Brexit, talking or not talking about politics has unavoidably become just as symbolic in guiding as it is in other areas of life. In the beginning years of my career as a guide, I remember getting down to rather fine detail about the Hanseatic League during a four-hour tour in the Old Town, whereas now there is simply not enough time. Daily politics takes over the Old Town. The year when Taavi Rõivas featured on “The Daily Show”, I often had to comment on that topic. The Bronze Night prompted subject matter completely different from what has now resurfaced in light of the events in the Ukraine. British retirees, for whom a Baltic cruise is often their first journey to this part of the world, are oftentimes melancholic because they must say farewell to that part of Europe which has been seen through the distortions of journalistic mirrors up to now. In the grander scheme, however, what has influenced the tourism of the last decade the most is not political power plays but the triumph of smart phones. More and more tourists withdraw from traditional travelling methods accompanied by hotels, travel agencies or tours led by attested guides. One month into my studies in Lisbon, I already had to start making extra money as a guide. I contacted an establishment, the kinds of which municipal governments fight against all over the world – an agency that offered so-called ’free tours’. The free tour scheme is generally as follows: tours are led by guides without any institutional preparation, partaking in the tours is free for the listeners but it is presumed that the tourist tips the guide afterwards (the guide obviously has to pay a substantial portion of their earnings to the “agency”). I accepted the challenge, spent a few weeks cramming all I could about the history of Portugal and the architecture of Lisbon and thought I managed the first tour pretty well. On the second work day, a North American tourist with a bad attitude performed a fact-check in Wikipedia on every detail I presented, putting considerable effort into trying to invalidate or just disconfirm everything I said. He seemed deeply disturbed by a non-local introducing Portugal to him because the purpose of travelling is to sense the true authenticity of a place. This painful experience raised several questions for me that I had been pondering as an art and architecture critic for a long time. Guide work, just like history of art, is traditionally considered a national discipline where “we” and “they” are well placed in predestined positions. Working as a local guide in Lisbon it was interesting for me to keep track of myself, namely when I would speak of the Portuguese as “us” and when I would address them as “them”. Admittedly, I had followed this kind of separation on my Estonian-Russian colleagues who frequently have to position themselves on one or the other side of “us”. For some it is natural, while for others it can be a painful and difficult process. Difficult because the specifics of working as a guide force you to inevitably become a Hegelian who interprets the history of their city, country and nation as rationally as humanly possible. In such a narrative, all tales and facts relate causally to the present day, i.e. the product of history. History as a sequence of flashes becomes a patterned story. Figuratively speaking, all that has ever happened on this land, happened so that we could now study in a free state in our state language (although, what if it is not your mother tongue? ), participate in free elections (but what if they are not too eager to represent you? ), make Skype calls (to all those friends that have left the country? ), pay in euros, sell your very own forest, etc. It is possible to narrate all kinds of stories in a singular fashion, although it is my belief that the best guides are able to transcend the single story without breaching their guide ethics, quite like the Nigerian author, Chimamanda Ngozi Adichie, has said about the single story not being false, just incomplete. Whosoever has participated in a tour led by a highly valued art or architecture historian, knows what I am talking about. Speaking of vivid speakers, I am reminded of Roland Barthes who purportedly said that he does not think much of death but when his teacher of Old Greek passed on, he was deeply moved because he felt that no library in the world could ever replace such synthesis of knowledge as what was buried with that man. I tell this to imply that a tourist may have limitless roaming for internet use but it will never compete with a tour given by a wonderful guide. For example, my impetus for becoming a guide came from visiting the Uffizi Gallery as a teenager where the tour was led by Giorgio Vasari, a 16th century humanist and founder of the named museum, also considered the trailblazer of art history as a discipline. I was familiar with his name from art history classes but the way the guide, dressed up as an artist playing Vasari, performed, was completely breathtaking. For a guide, words are in the service of impeccably operating communication. In that regard, the guide may be considered an interpreter and the work itself a translation by which the guide assumes the responsibility of communicating a local piece of art or architecture to a foreigner. Seeing that the purpose (of guiding) is successful communication, it is natural for guides to prefer topics that are easier to pass on. Here is an example. Ever since beehouses appeared in the courtyard of the Office of the President of the Republic of Estonia, I can be the most expressive narrator there is on the topics of Peter the First, Kadriorg, the presidents and Kumu, but the story about the head of state giving away honey collected from local roses to her foreign visitors surpasses all else. This small-scale yet human tale is particularly touching for Asian tourists to whom Peter the First or the Baroque Era come off as exoticism anyway, just like the paintings from the time of Emperor Kangxi or the Ming Dynasty seem exotic to us. For this reason the president’s beeyard represents a universal monument to me. The French spatial theoretician Henri Lefebvre has compared monuments to everyday language: let us assume that two people meet and they start talking; initially the topics are light, gradually, concepts like love and hate, childhood and aging, home, family and separation, are introduced, until neither can escape more elaborate thoughtscapes, references to philosophical theories or literary works, because questions that touch upon the basic values of being human must be addressed. It is quite likely that at this moment the conversation becomes oversaturated and the talkers find themselves in a mental dead-end. According to Lefebvre, monuments in public city space act exactly in this manner, by being as proverbs full of wisdom and packed with controversy. All roads and conversations lead to monuments, but where to go from there? A moment of comparison from working as a guide: soon after the opening of the War of Independence Victory Column, I felt it best to talk about other things while driving past it on a bus (just like it is not reasonable to talk about “The Broken Line” monument to cruise tourists). Mentioning it would bring up many questions that could not be dissected successfully during a short tour. Fortunately for a guide, Tallinn Old Town is fairly void of monuments, leaving the city with its stories as the main character of the tours. I have talked about guide work and concentrated on translating, narratives and all that which in the semiotic plane would constitute as symbolic and united. However, paradoxically, tours are mostly dominated by the indexical or referential dimension. Guides must not forget themselves to talk about whatever, since throughout the tour the surrounding architecture and material culture is framing their choice of subject matter. For this reason, a considerable amount of a guide’s lexicon is their stance, facial expression and gesture that help to focus attention on the sites of their hometown. Once a guide starts to point their finger toward the right things, the city starts unravelling by itself. Many urban researchers have claimed that architecture is characterised by endless semiosis, i.e. it is close to impossible to state for a fact what one or the other work of architecture or detail stands for. The guide, therefore, enjoys endless freedom and an equally vast responsibility to be able to attach an exclusive meaning to an edifice. To me personally, it seems the meaning and value of a work of architecture mainly expresses itself in individual perception. A tour is a wonderful format for such an intimate experience of spatial culture. Firstly, seeing is believing, secondly, a tour activates spatial imagination, and thirdly, a viewer’s experience is enhanced by the knowledge of a local professional. In view of all of the above, I would like to make the following points to summarise the relationship between guiding and architecture: a) Guiding ennobles, canonises and aestheticises certain spaces, therefore also fetishising and making them objects of visual desire; b) Guiding systematises, categorises, yet equalises, universalises and suppresses diverse architecture under one discourse to make it comprehensible and narratable across the world; c) yielding the conclusion that the primary function of guiding is to create narrative for architecture; d) but simultaneously re-extend to architecture its radically three-dimensional, bodily and peripatetic essence; e) Guiding has the tendency to personify architecture by explaining it through historical figures on the one hand, while also being predisposed to the life story of the guide him-/herself on the other; f) Guiding translates architecture, making the guide the interpreter, and architecture – both the original and the translation; g) Depending on the interpretation, architecture may become the substitute for history, a metaphor for local way of life; h) Last but not least, the essence of travelling and guiding is the urge to satisfy curiosity, people’s wish to let go of everyday routine and a desire to experience something different culturally. This makes architecture in guide work democratic and curative, nourishing curiosity as well as tolerance toward other cultures. Revisiting Jaak Jõerüüt’s short story, the main character was worried if he would be able to fulfill the function of a local walking-talking state and reach a high enough level of communication with the walking-talking city, state, country from afar so they would not remain symbols to one another but become human again. The guide comes to a final conclusion that the tourist had added a grey old man, blackcurrants and me to his knowledge. He had visited these small peoples, they existed. The grey old man in the story is an allusion to the Ülemiste Elder and the myth of the flood, deemed significant by the visitor with an interest in mythology. Blackcurrants symbolise the local food culture that can be experienced with locals only after the berries have been picked. “I” is a real person in the story who desperately tried to mediate the masterpieces of local building art, but inevitably ended up talking about himself and his culture only. Gregor Taul is a trained semiotician and art historian, currently freelance culture critic and doctoral candidate at the Catholic University of Portugal.